Use the resources below to help you understand the CRAAP test for website evaluation. 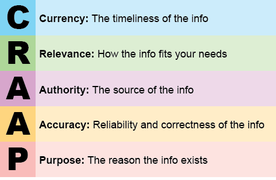 Use the CRAAP test to help you determine if a resource should be used for an assignment. Mrs. G says "Do you remember which criteria is always the deal breaker for a source?" Jane calls it "The Big One." Use the CRAAP TEST Worksheet to guide you through each of the five criteria. Still unsure about CRAAP? You can also check out Mrs. G's CRAAP Test introductory lesson.